Forty years after Singapore embarked on a cleanup of the Singapore River, the Prime Minister says that keeping the river clean is a relentless effort and that people should help by refraining from littering. "The river cleanup is never done," said PM Lee Hsien Loong yesterday. "Singaporeans still must learn not to drop litter and trash on the ground, which washes into drains and the river, and has to be caught with booms along the way." He was speaking at a 60th anniversary event of Malay daily Berita Harian. The newspaper's celebration includes a five-day exhibition by the Singapore River, honouring pioneers' efforts in the cleanup, which started 40 years ago. The amount of litter removed from the 3.2km-long Singapore River has barely budged in the past five years, said PUB. Its contractors, using vessels such as flotsam removal craft, retrieve an estimated 200kg to 400kg of litter a day from the river, between Kim Seng Road Bridge and the Esplanade Bridge. "The amount of litter has not significantly changed from five years ago," the national water agency told The Straits Times in response to queries. Besides leaves and twigs, litter collected includes plastic bags and plastic bottles. 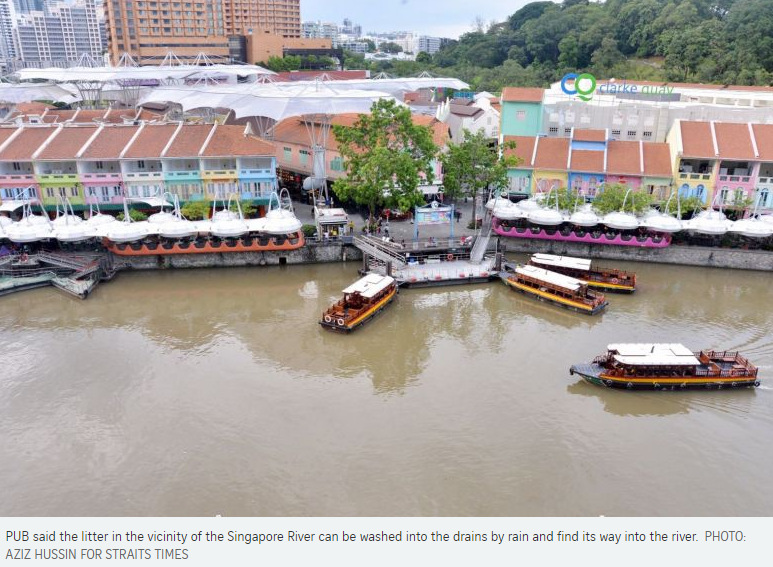 It added that litter in the vicinity of the Singapore River - which includes spots such as Clarke Quay, Boat Quay and Robertson Quay - can be washed into the drains by rain and find its way into the river. The National Environment Agency, which takes care of the rest of the river upstream of Kim Seng Road Bridge to Alexandra Canal, was unable to respond on the amount of litter it retrieves. In his speech, PM Lee recalled the state of the Singapore River prior to 1977: "The water was black, notoriously smelly and toxic." A blind telephone operator who worked at his mother's law firm always knew when to get off the bus because he could smell the river when the bus crossed it. It took much coordination, planning, as well as "determination and political will" to remove the pollution. Over 10 years, Singapore dredged up the polluted riverbed and removed pig farms and other pollutive industries, he said. There was also a need to connect every premise in the catchment to sewers, relocate squatters to Housing Board flats, street hawkers to new hawker centres, and shipyards to Pasir Panjang, he added. Dr Albert Winsemius, the chief economic adviser back then, even had a bet with the river cleanup team, believing that the river would not sustain life, recalled PM Lee. "He recommended that we turn the Singapore River into a sewage system by covering it up," he said. On what can be done today, the chief executive of water solutions company Aquayana, Mr Hassan Ahmad, said there could be more platforms to show the impact of such litter on the water supply. He added that as "habits die hard", there also has to be education at all levels. "As (former PUB chairman) Tan Gee Paw said, you don't need a PhD to solve the issue, it's more about willpower, to rally the people to solve it together," Mr Hassan said. Mr Tan was involved in carrying out the river cleanup project, and is now special adviser to the Centre for Liveable Cities. While some newspapers around the world have "succumbed to the temptation to sensationalise news, use click-bait headlines and even publish unverified stories", local dailies such as Berita Harian must always continue reporting accurately, responsibly and from a national perspective, said Prime Minister Lee Hsien Loong yesterday. "As Singapore's only Malay daily, you play a vital role in influencing your readers, and strengthening our multiracial and multi-religious social fabric," he added. He was speaking at an event to celebrate the newspaper's 60th anniversary, at Swissotel Merchant Court Singapore hotel. He noted that Berita Harian, which is published by Singapore Press Holdings (SPH), "has kept (its) journalistic integrity and prudence" and must always do so. This is despite the worldwide trend of newspapers finding it difficult to retain readership and maintain revenues, he said, adding that quite a few struggle to stay afloat. He compared the Malay daily's need to keep up with new challenges to the constant effort of maintaining the Singapore River's cleanliness, saying that the job is never done. "You have to keep up with your readers' changing profiles and interests," said PM Lee. "At the same time, you need to deal with the disruptions brought on by the digital age - competition from social media, and confusion from fake news." Speaking in Malay, PM Lee also said that the Singapore River reflects the nation's modernisation and progress, similar to how Berita Harian has become a major institution of Malay society. 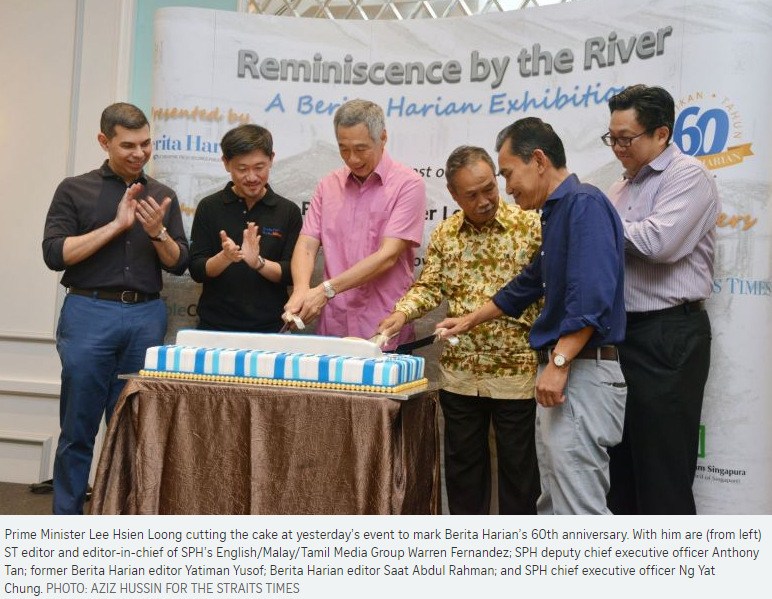 Berita Harian's 60th anniversary celebration involves a five-day public exhibition, which ends on Thursday, to show the Malay/Muslim community's appreciation for pioneers who helped in the river cleanup that began in 1977. Cleaning up the river and the surrounding catchment area was a move that took 10 years of hard work, demanding determination and political will, said PM Lee. Today, Singapore intends to continue beautifying the river and transforming itself, he added. While Berita Harian's reader profile has changed, progressing with the nation as it moved from Third World to First, "(its readers) continue to read (the paper) to stay in touch with what is happening in the community", said PM Lee. He noted that while the newspaper has refreshed its content and presentation to appeal to the younger generation, it has also stayed true to its founding objective: of being "a bridge to foster better understanding and relations between Malays and the members of the non-Malay community". Minister for the Environment and Water Resources Masagos Zulkifli, and Senior Minister of State for Defence and Foreign Affairs Maliki Osman were also present at yesterday's event.